There are three ways you can help support Witherle Memorial Library. We’re always looking for volunteers to help out with our daily operations, programming, and fundraisers. If you’re interested in volunteering your time and talents, we would love to hear from you! Your financial support helps fund programs and materials not otherwise covered by our operating budget, and ensures that we can continue to provide outstanding services to our patrons. You can make a donation in the form of either a gift or a memorial donation. You may also choose to make a financial contribution to the Friends of Witherle Library. The Friends of Witherle Library are the only source of funding for Witherle Library programs aside from various grants the library’s staff members apply for. You can make a donation in the form of either a gift or a memorial donation. For more information about the various ways to donate please contact the library desk. Cleaning out your closet or bookshelf? We accept materials that are gently used and in good condition. 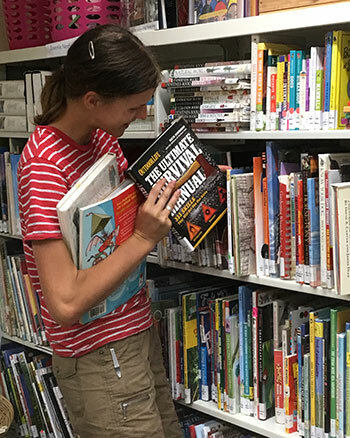 All donated materials will be evaluated and either added to our library’s collection or included in the Friends of Witherle Book Sale, which funds all juvenile and adult programming. Please no textbooks, magazines or materials in questionable condition. If you have a quantity of materials please contact the library to arrange a time for delivery. Use the button below to donate with a credit card or PayPal account. The Witherle Library maintains drawers of information detailing the different parts of Castine’s history as well as ephemera, art and maps. A significant section is dedicated to the life and work of Deborah Pulliam, the library’s great benefactor. 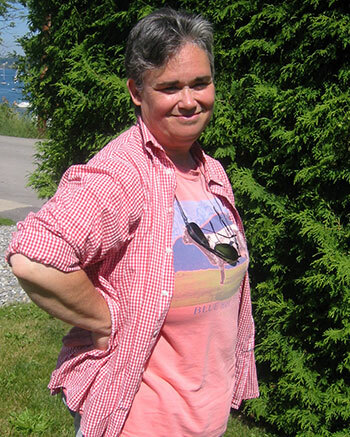 Interestingly, Deborah was a textile historian and wrote many papers on the subject. These are included in her collection. The Friends logo was created by Tom Barrett in 1992, while he was serving as Friend’s treasurer. In 1993, Tom, in collaboration with his wife Leni Mancuso, created the library’s logo for the campaign for the new tile roof. These images along with other Friends publication and ephemera are a part of the library’s local history collection. 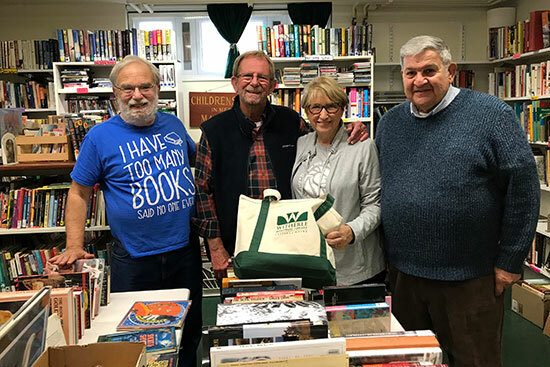 The Friends of the Witherle Memorial Library provide financial, volunteer, and program assistance to help fulfill library needs not easily met through its normal funding sources. The funds raised by the Friends – including proceeds from their book sales – contribute toward everything from special book and media purchases to new furnishings. The Friends also offer special programs for library users (both adults and children) throughout the year, as well as a regular newsletter. We welcome new volunteers and contributors to support the Friends’ role as the constant, benevolent “godmother” of Castine’s library. The Witherle Memorial Friends of the Library is a registered 501-c-3 corporation and gifts may be tax deductible to the full extent of law. To find out more please contact your tax advisor. Become a Friend! Your gift is a great help to the library in presenting programs, acquiring non-budgeted equipment and materials, and providing volunteers for our various projects. Step into the library to make your contribution today! $10.00 for an individual, $15.00 for a family. Thank you in advance for your support.